Buy Now Segments are recommendations of great values for card sets. While a specific card in a set can be sold to even out or gain profit for the set, these are only suggestions and should be purchased at one’s own risk. Recently Scavenging Ooze rose to $30 $40 at Star City Games. This has put the value of the card above the MSRP price of the Commander Deck it belongs to; Counterpunch. Based on the price history above, the Ooze has been sitting at a $20 price point for most of it’s life cycle. 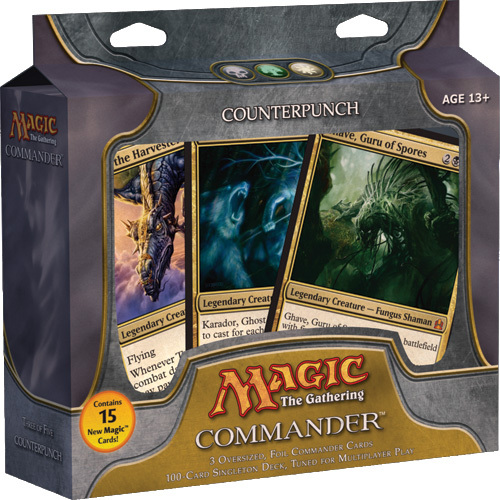 With the continued popularity of the Maverick deck in Legacy, and the ability to only get this card through the Commander deck, this is a great time to purchase the Counterpunch deck if you can at the MSRP price of $30. Financially, this is a good deal for the Scavenging Ooze alone. The other cards listed do provide good trade value, and OK resell value (although for the prices they may not be worth the trouble.) For a game play standpoint, this is a great deal. Not only do you get to almost cover the price of a Commander deck, it’s also one of the most fun decks to play. If you do decide to buy this set for the retail price, there are a couple of suggestions. Target carried all the Commander decks when they were released and you may still have a chance to find the decks at some locations. Otherwise, try a comic or or general game shop. Most Magic card shops will know the value of Scavenging Ooze and will mark the Counterpunch deck higher. PreviousThe cost of winning Legacy decks.